Add a little pizzazz to your hair color with peek-a-boo streaks or highlights. 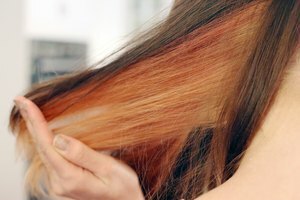 Hide a flash of color in your locks with this hair coloring technique. The color can vary from natural-looking highlights to a splash of an unusual color like purple or red. The color is placed within your hair instead of on the top of your head. The color peeks out when you move your head. Blonds can streak their hair with just about any color. Dark tones can have bleached streaks or red tones. It may be necessary to bleach dark hair to platinum blond before applying a color such as green or blue so the color will show up. Gather the top 2 inches of your hair and lift it away from your head. Take the hair about 2 inches from your part and clip it out of the way from the other hair. Put on the protective gloves. Mix the hair color according to the directions on the packaging. Select a 1/4-inch-thick section of hair with the pointed end of the comb and place a piece of foil underneath the roots of the hair. The foil will need to be snugly placed against your scalp. Lay the section of hair down onto the foil. Hold the hair to the foil with your thumb. Place your other fingers underneath the foil to secure it. Dip the paint brush into the hair color. Drag the brush on the side of the container to remove the excess from the brush. Brush the color onto the hair starting at the roots. Swipe the color onto the entire section of the hair. 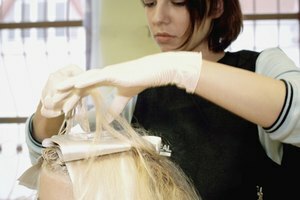 All of the hair, including the ends, should be on top of the foil when you are done applying the color. Fold the foil in half by lifting the end toward the scalp. Press the fold to crease it. Fold the sides in toward the middle a 1/2 inch. No hair should be sticking out or else it may bleed color onto a section that will not get colored. Repeat Steps 3 through 6 to another section of hair. 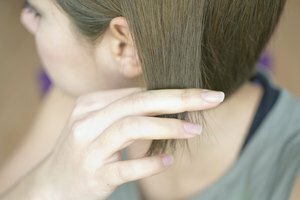 You want to choose sections of hair that will be seen when you move, like the sides, the back and the hair behind your ears. A friend may have to help with the sections on the back of your head. Apply the same amount of highlights on each side of your head. Remove the foils and rinse the color from your hair. Style as usual. 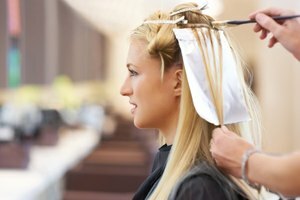 Do not color more than one-third of your hair with peek-a-boo streaks or it will be too prominent. The best part of the streaks being underneath other hair is that the roots aren’t so obvious when the hair grows out.